Black is timeless and elegant, and most women have tons of it in their closets. Nothing is more chic than the little black dress. I worked for Chanel Inc. for a decade, and I think at one point two-thirds of my closet was black! But when it comes to incorporating black into the home, people tend to shy away from it. But it doesn’t have to be scary! Especially with soft, neutral rooms, (which I am a big fan of!) black helps bring focus. 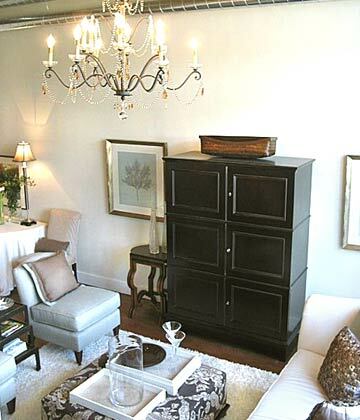 The trick is to use it SPARINGLY, I like to have a touch of black in every room…it adds a little modern. 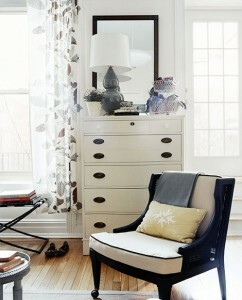 I also love its ability to update and pull together disparate pieces of furniture and accessories. When you paint different wood tones black, they magically all seem to go together. I’ve spray painted furniture, frames, chandeliers, candle sticks, and lots more with amazing results. Let me know how it works for you!